The Star Trek: The Next Generation gang once took a li’l trip to Nottingham. 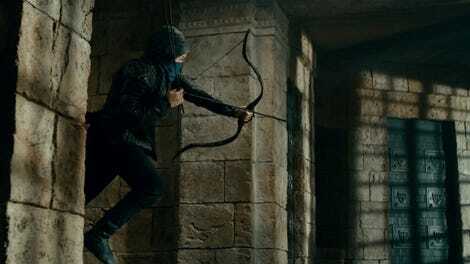 The legend of Robin Hood has been around since the 15th century, possibly even earlier, and is still as popular as ever. As Hollywood rolls out a “gritty” take on the story this week, there’s no better time to recall our other favorite versions that took a deliberately non-traditional approach to the classic tale. This is not to say that we don’t love the character as played by the likes of Douglas Fairbanks, Errol Flynn, or Kevin Costner (actually, we were rooting for Alan Rickman’s Sheriff of Nottingham in that last one). But for the purposes of this list, we went looking for offbeat, unusual, unexpected, or just plain weird Robin Hoods. And considering how often this story—which has, obviously, long been in the public domain—has been told on screens big and small, there was a lot to choose from. Here are our 10 favorites, in no particular order. Star Trek’s smarmy extra-dimensional being Q decides he owes Picard a favor, so when he sees that the Captain and comely artifact hunter Vash have called off their brief romance, he decides to play (ahem) “Qpid.” He transports the duo—and the rest of the crew—to Sherwood Forest, where Robin Hood-themed hijinks ensue. Worf is perhaps the most horrified (“Sir! I protest! I am not a Merry Man!”), but nobody is thrilled to be stuck in Q’s scenario, especially when Q (who takes on the role of the Sheriff of Nottingham, natch) reveals that the fantasy’s consequences—like the impending execution of Vash, aka Maid Marian—will be all too real if Picard (as Robin Hood) doesn’t rescue her in time. After a bit of derring-do, there are happy endings for all involved...most of all for the viewer. The actual storyline doesn’t really linger, but who could forget the sight of Picard gallantly sword fighting up a staircase, or Worf apologetically but emphatically putting an end to Geordi’s lute-playing ambitions? A teenaged Keira Knightley plays Gwyn of Locksley. This “Wonderful World of Disney” made-for-TV production isn’t the first gender-swapped version of the Robin Hood story. Princess of Thieves seems to take after one in particular: 1959's The Son of Robin Hood, which imagined that Robin Hood is dead and his son, who is actually (surprise!) his daughter, arrives in Nottingham to help renew the fight against her father’s enemies. In that movie, though, a lot of the heavy lifting is handled by the movie’s vast majority of menfolk. The far more forward-thinking Princess of Thieves lets its daughter-of-Robin character, played by a pre-Bend It Like Beckham Keira Knightley, take a way more active role in the heroics. There is a star-crossed romance, of course, but there’s also some nice father-and-daughter stuff, as an aging Robin (who’s imprisoned for most of the movie) comes to realize the daughter he barely knows—mom was Maid Marian, who somewhat predictably is explained away as having died in childbirth—has inherited his equal tendencies toward bravery and rebelliousness. You can see why Chicago is Robbo’s kind of town. The members of the Rat Pack (plus Bing Crosby and Peter Falk) headline this musical that adapts the Robin Hood story to Chicago’s criminal underworld, a place filled with cigars, pinstripes, machine guns, double-crossing dames, do-gooding wiseguys, adorable orphans, gambling, and so many fedoras. Frank Sinatra’s performance of “My Kind of Town” (wearing a green suit that winks at Robin Hood’s traditional outfit)—a song that would go on to be Oscar-nominated (it lost to “Chim Chim Cher-ee” from Mary Poppins)—is probably the moment in the movie that has the most lasting cultural impact; it certainly ain’t the jaw-dropping number where Sammy Davis, Jr. joyfully sings and tap-dances to express how much he loves guns. But if you revisit Robin and the 7 Hoods specifically with the Robin Hood legend in mind, you’ll be surprised to see it doesn’t exactly all work out for “Robbo” and his gang (including the perpetually sloshed Dean Martin as the perpetually sloshed Little John) in the end, thanks in no small part to the movie’s version of Maid Marian, who’s reimagined here as the glamorous, greedy daughter of a recently deposed mob kingpin. Robbing Wayne Manor is much easier than you’d think, actually. Robin Hood is, shall we say, not usually portrayed as a villain, but the first two episodes of Batman’s second season found a way to do it. “The Archer”—a horseback-riding rogue who speaketh using flowery, old-timey language (played by Art Carney)—initially targets the richest guy in town, robbing Wayne Manor with the help of his associates “Crier Tuck” and “Big John.” (Later, we meet “Maid Marilyn,” who’s inexplicably chomping on a piece of fried chicken in nearly all of her scenes.) After the Archer makes it rain free cash in Gotham, the city’s most downtrodden residents briefly turn on Batman and Robin, believing there’s a new hero in their midst. But the Archer soon reveals he has his eyes on a more selfish prize, planning to boost millions that are intended for charity with the help of a crooked Wayne Foundation employee. Stealing from the rich to give to the poor is one thing; stealing from the poor to line your own pockets is another thing entirely. 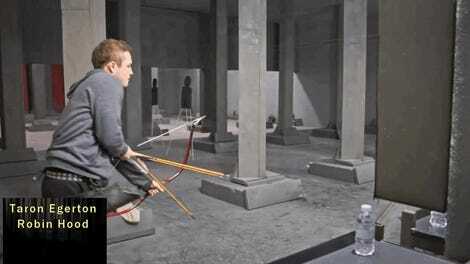 The real Robin Hood would not approve...and it makes Batman pretty furious, too. Peter Capaldi’s face. That is all. Clara really wants to meet Robin Hood, whom the Doctor is pretty freaking sure doesn’t really exist, but they head to the proper time and place and lo and behold, there he is (played by Tom Riley), even merrier than the time-worn tales suggest. The Doctor (who immediately sword-fights Robin Hood...with a spoon) has a hard time putting aside his disdain for the man and his wanton mirth—at least until it’s revealed that the power-mad Sheriff of Nottingham’s usual evil scheme against the local peasants has been ramped up exponentially, thanks to the presence of hulking robotic knights and a castle that’s concealing a spaceship that uses gold as fuel. The Mark Gatiss-scripted episode has a gleeful time reworking the familiar beats of the Robin Hood story—but especially when it’s making the skeptical Doctor clash with the saucy Robin Hood, who turns out to be a true hero that even the Doctor admits is worthy of legendary status. Terry Gilliam’s cult-classic fantasy—which was recently picked up for a possible Apple streaming TV show—is about an imaginative kid who gets caught up with a band of time-traveling dwarfs who are supposed to be repairing a space-time rip, but are instead pinballing through history evading the forces of good and evil in search of valuables. Their wacky and fantastical journey brings them to places like the deck of the Titanic and ancient Greece (where they meet Agamemnon, played by Sean Connery), and they also have an encounter with Robin Hood, played by Gilliam’s Monty Python cohort John Cleese. Cleese’s frightfully polite character is only onscreen for a few moments, but the darkly hilarious scene will stick with you nonetheless...much like a punch right in your face. 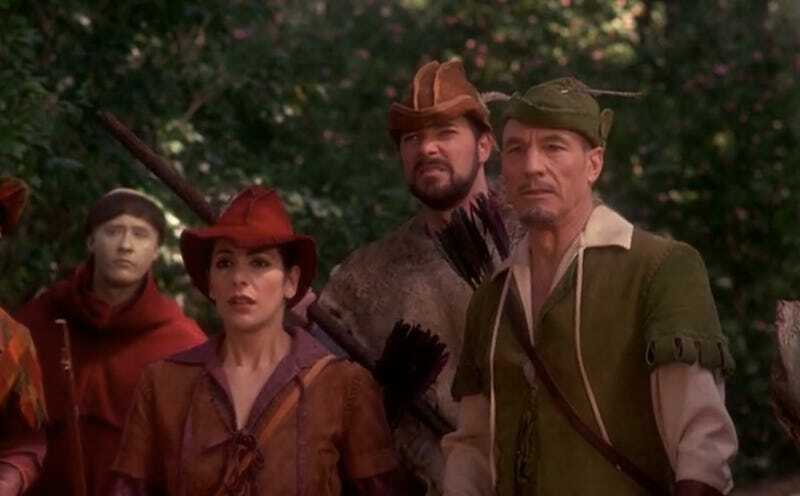 Kevin Costner’s 1991 Robin Hood: Prince of Thieves is the prime target of this parody musical from comedy legend Mel Brooks (Blazing Saddles, Young Frankenstein, Spaceballs), though the whole Robin Hood mythos gets pretty well roasted here. The movie, which wasn’t terribly well-received upon its initial release but has since become a cult classic, also features a very early turn by Dave Chappelle (playing the son of Isaac Hayes), the sight of Dom DeLuise spoofing The Godfather, and at least one “PATRIOT arrow” joke that references what was then the very recent Gulf War. Cary Elwes, of course, was a natural choice to play the hero after his slightly more earnest (but still irreverent) turn as a dashing outlaw in The Princess Bride. Miss Piggy is not pleased. Guest star Lynn Redgrave brings the necessary mix of good humor and gravitas to The Muppet Show’s adorable interpretation of the Robin Hood legend, which casts Kermit the Frog as the title hero, Fozzie Bear as Little John, the Great Gonzo as the Sheriff of Nottingham, and Redgrave as Maid Marian. As is Muppet Show tradition, the backstage drama interferes with the cavorting onstage when Miss Piggy takes issue with her casting as “Sister Tuck” and locks the real leading lady in her dressing room, briefly forcing her way into the role she believes should’ve been hers all along. Hiii-yah! It wasn’t the first or last Robin Hood adaptation to star animated animals, but—apologies to Ren & Stimpy—it will forever be the best. It’s hard to pick a favorite element, but for me it’ll always be honky-tonk king Roger Miller as Merry Men stalwart Alan-a-Dale, rooster, troubadour, and scene-setting narrator (“My job is to tell it like it is, or was...or whatever”). For many—apologies to Errol Flynn—Robin Hood as an anthropomorphic fox will forever be the definitive interpretation of the character. And the film itself has become just as timeless as the story it tells.